Unlike other teeth, such as the lower premolars that are also hereditarily missing with a similar incidence, the esthetic consequences are more significant for an anterior tooth, such as the lateral incisor, and this will influence the choice of the treatment plan to fill the void left by the absence of one or both lateral incisors. Another significant thing to consider is the replacement cost of a missing tooth if its replacement is preferred to closing the space orthodontically. Different prosthetic options allow the replacement of incisors (partial denture, Maryland bridge (resin bonded), bridge, crown supported by a dental implant). The cost of these prostheses can vary from several hundreds of dollars for the simplest removable partial prostheses that can replace both lateral incisors to more than 4000 to 5000$ per tooth for an implant-supported crown (for each lateral incisor). Several considerations need to be kept in choosing the ideal treatment for a young patient and the parents must be involved in this decision. Open the spaces and replace the missing teeth prosthetically. Close the spaces by moving the posterior teeth forward. The canines will replace the lateral incisors and the premolars will replace the canines; the teeth will be “modified” or reshaped accordingly. A combination of both: opening on one side and closing on the other side. 13-year-old teenager with the permanent upper lateral incisors missing (anodontia). The canines have erupted where the missing lateral incisors should have been and there are spaces between the teeth. Options of treatment are either to keep the canines where the lateral incisors should be and close the current spaces or to open the spaces and replace the lateral incisors after the orthodontic treatment by bridges or implants (done by the general dentist). Several considerations need to be kept in mind to choose the option of treatment and the patient (or his/her parents) is involved in this decision. The general dentist is consulted to determine the best way to replace the teeth. The upper canines were modified and brought closer to close the anterior spaces and thus replace the missing lateral incisors (arrows). This approach avoids having to use bridges, implants, etc. to replace the lateral incisors. 15-year-old teenager having both upper lateral incisors missing (congenital absence/anodontia). After consulting the general dentist, it was decided to open the spaces for the lateral incisors and to replace them prosthetically after the orthodontic treatment. The prosthetic options are the installation of a dental implant (as in the case below), a bridge (butterfly or conventional bridge) or the use of a removable partial prosthesis. The spaces for the lateral incisors are progressively opened during the treatment and, once they are large enough, artificial teeth are positioned on the “braces” for better esthetics. At the end of the orthodontic treatment, teeth are also positioned until dental implants and crowns that are more esthetic can be made by the dentist. To see every step of the treatment of a similar case and to learn more on congenitally missing teeth. Not only crowns, but roots as well! When dental implants are chosen to replace lateral incisors (or any other tooth), the position of the adjacent teeth to the missing teeth, and their root(s) in particular, is very important to allow an adequate positioning of the implant. If the roots are badly tipped or misaligned, the installation of a dental implant may be impossible. The orthodontist will work in collaboration with the general dentist or other specialists responsible for the installation of the implant (periodontist, maxillofacial surgeon) to position the teeth optimally to allow the installation of the implants. To learn more on orthodontic corrections in the planning of dental implants, dental implants and see other examples. The upper central incisors are showing too much tipping and will therefore prevent the installation of a dental implant to replace the missing lateral incisors. (A) Before the treatment, the blue arrows indicate the missing lateral incisors. (B) These lateral incisors are replaced by prosthetic teeth bonded to the adjacent teeth. (C) A panoramic radiograph confirms the bad position of the central incisors. (D) Enlarged view of the radiograph and implants added in a simulation. The blue dotted lines represent the ideal position that the central incisors should have. (E) This patient opted for lingual braces for esthetic reasons. 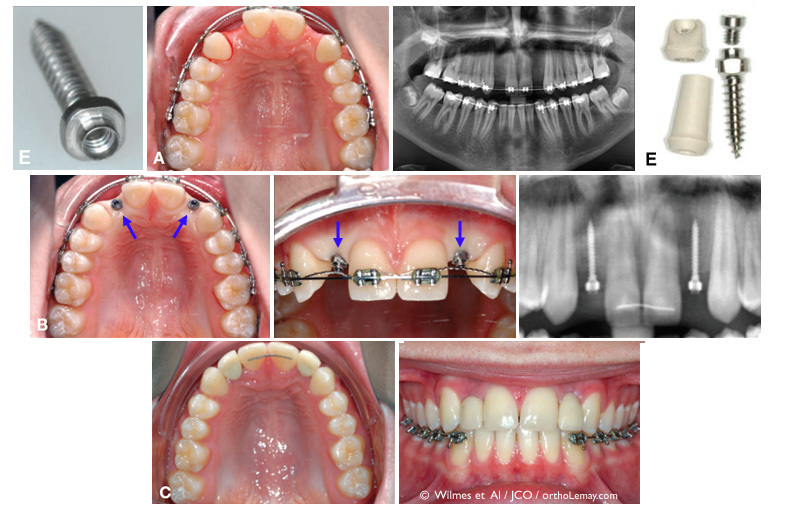 (A) Root parallelism and inadequate space between the roots during the orthodontic treatment. (B) After a few months, the roots are parallel and there is enough space to install dental implants in the toothless spaces. This 41-year-old man’s case illustrates well how combining both approaches can be envisioned. After discussing with his general dentist, the patient opted for closing the space for the right lateral incisor and replacing the left one by a dental implant after the orthodontic treatment. The mechanics used was therefore aiming at “moving forward” the posterior teeth on the right side and opening the space on the left by moving the left incisor toward the midline and by slightly moving a little bit more the posterior teeth backward. The space on the left must be wide enough to allow the installation of an implant, which requires at least 7-8 mm and the roots of the teeth adjacent to the future implant must be adequately tipped. To learn more on root inclination in dental implant planning. The right canine must be modified by grinding it and by adding composite material or a facet so it looks as much as possible like a “normal” lateral incisor and the one on the opposite side. It is to be noted that it is often harder to obtain an ideal “occlusion” or interdigitation when a premolar replaces a canine and when the canine must be positioned where the lateral incisor should be. Thus, in the example below, the occlusion at the end of the orthodontic treatment is not as good on the right side (C pictures) than on the left side where no tooth substitutions were performed. 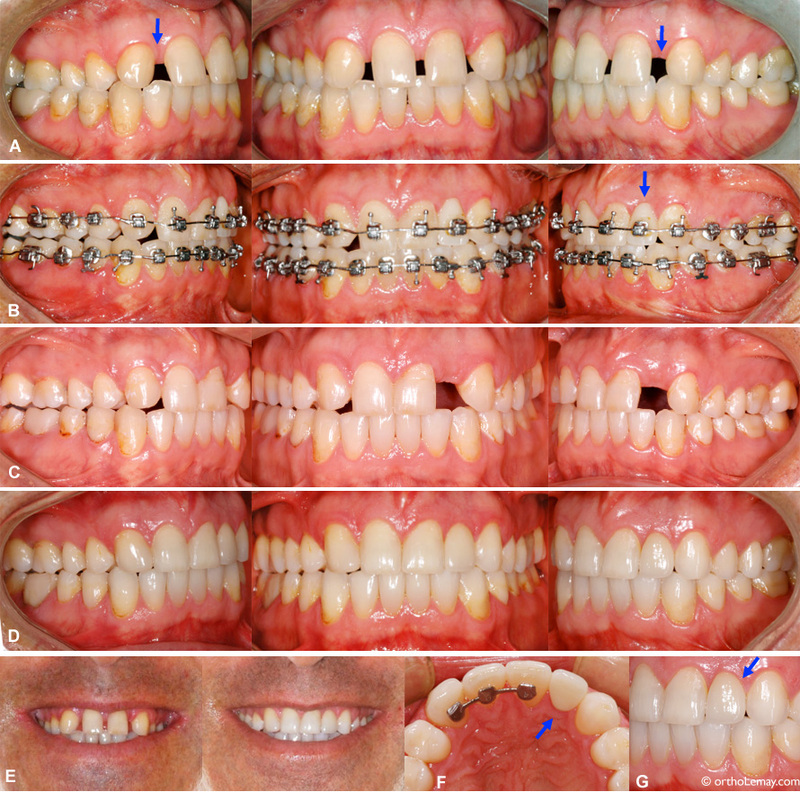 However, one year after the orthodontic appliances (braces) were removed, the teeth adjusted and better functional contacts are present on the right side (D pictures). (A) Anodontia of the upper lateral incisors (arrows) in a 41-year-old adult. (B) Closing of the space on the right side and opening of the space on the left side during the treatment. A prosthetic tooth supported by a bracket was installed on the orthodontic archwire for esthetic reasons. (C) Once the orthodontic corrections are finished, the right canine is against the lateral incisor and the space on the left is ready to receive a dental implant. The occlusion (interdigitation) on the right side presents more irregularities than on the left side where the canine has a “normal” position. (D) One year after the installation of the implant and the left crown, as well as a ceramic facet on the right canine that replaces the missing lateral incisor. (E) Smile before the treatment and after the prosthetic restorations. (F) Ceramic crown on the implant. (G) The gum tissue contour is well adapted to the crown. Depending on the characteristics of the case, different restorative options using facets, crowns, dental implants, different kinds of bridges, etc. can be used. (A) Short and narrow right lateral incisor, congenital absence (anodontia) of the left lateral incisor. (B) The gingival contour of the right central and lateral incisors was modified to be more in harmony with the same opposing teeth and the right lateral incisor was rebuilt in composite material. A dental implant replaces the left lateral incisor. (C) Anodontia of both lateral incisors in a 19-year-old young woman. (D) Cantilevered bridges anchored to the canines replace the lateral incisors. What are the benefits and disadvantages of each option? Modifications to the adjacent teeth are not required, unlike when a traditional bridge is used or when the canine must be reshaped to replace the lateral incisor. The occlusion can sometimes be better when all the teeth are present. A canine that is ideally positioned allows an optimal function. More expensive, the crown will need to be replaced several times throughout a lifetime. The installation of the implant can only be performed when jaw growth is completed (± long delay), which can be toward 16-17 years of age for girls and 20-21 years of age for boys. Dental implants may fail after the intervention and complications may occur. The implant behaves like an ankylosed tooth, so if occlusal changes occur throughout the years, the position of the crown on the implant will not change, whereas the other teeth can move, which can cause an esthetic problem. 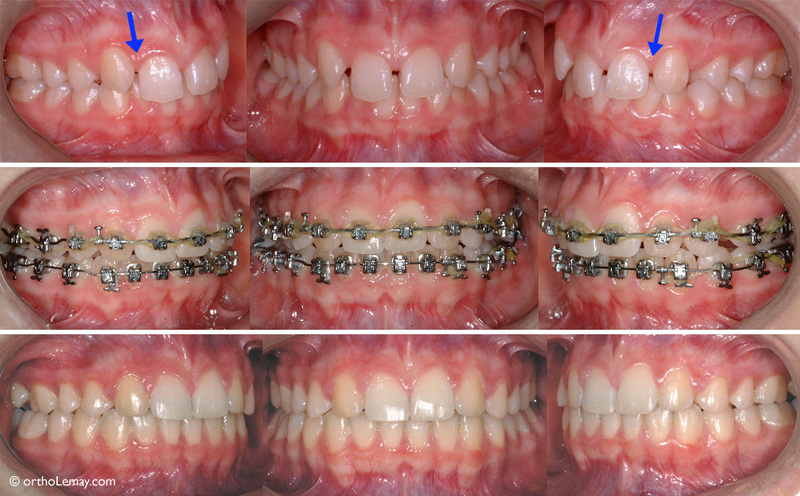 Can simplify the orthodontic corrections if a significant lack of space in the upper arch is present at the beginning. Make it possible to preserve the bone level in the area where the lateral incisor would be. Certain studies have shown that periodontal health is better with a natural tooth than with an implant. The shape and the color of the canine can be hard to harmonize with the central incisor, can require a modification using a facet or by adding composite. A study from Armbruster (2005)4 tried to determine how general dentists, orthodontists and other dental specialists were perceiving esthetic appeal relative to teeth on pictures of people who had missing lateral incisors that were either replaced by a butterfly bridge (bridge with wings bonded to the lingual surface of teeth), a dental implant or the closing of the space with canine substitution. These cases were compared to a control group composed of people who did not have any tooth missing. Orthodontists preferred the pictures without any tooth missing, followed by the canines that replace the lateral incisors, the butterfly bridges and the dental implants. More dentists and other specialists would choose to replace the lateral incisors by implants for esthetic reasons. However, several of these clinicians mentioned that they would choose to bring the canines closer together for their own child. To learn more on congenitally missing teeth and anodontia. Lateral incisors are not only affected by a relatively significant rate of congenital absence, but they also present formation defects that make them narrow, short and misshapen. Sometimes, these teeth can be “rebuilt” to give them a normal shape and dimension, but in certain cases, they can be extracted and the dentition is then treated as if there were congenitally missing teeth. (A, C; before the treatment) This 14-year-old teenager presents narrow and short lateral incisors (mostly the right one), as well as shorter roots than normal (B, D; after the orthodontic treatment) It was decided to extract the lateral incisors and move the canines forward to fill the spaces. The canines were reshaped. When an orthodontic treatment ends while the patient is a teenager, it may take several years before dental implants can be used to replace missing lateral incisors, because it is indicated to wait until growth is completed to install such implants. This avoids having the crown supported by the implant become uneven with the other teeth during the residual growth. This growth allows the teeth adjacent to the implant to move vertically, but the implant will not move, which will create an unesthetic irregularity. The problem with waiting several years before installing a dental implant is that bone loss or resorption may occur where the lateral incisors should be. A recent technique aims at preserving the alveolar bone and decreasing its gradual resorption by inserting temporary anchorage devices on which fake prosthetic teeth can be positioned. This gives an esthetic solution and preserves the width of the space available for the eventual replacement by an implant crown. When jaw growth is completed, the temporary anchorage implants are removed and a dental implant designed to receive a regular crown can be installed. Temporary anchorage mini-screws used for this are smaller than conventional dental implants and some screws have a slightly different design to anchor a crown on it (see example below).